As we continue into June with increased amounts of cookouts, a greater emphasis on baseball games, and more people taking extended weekends out at lakes and/or camping grounds, we’ve also been seeing something else rising just as quickly as the temperature. 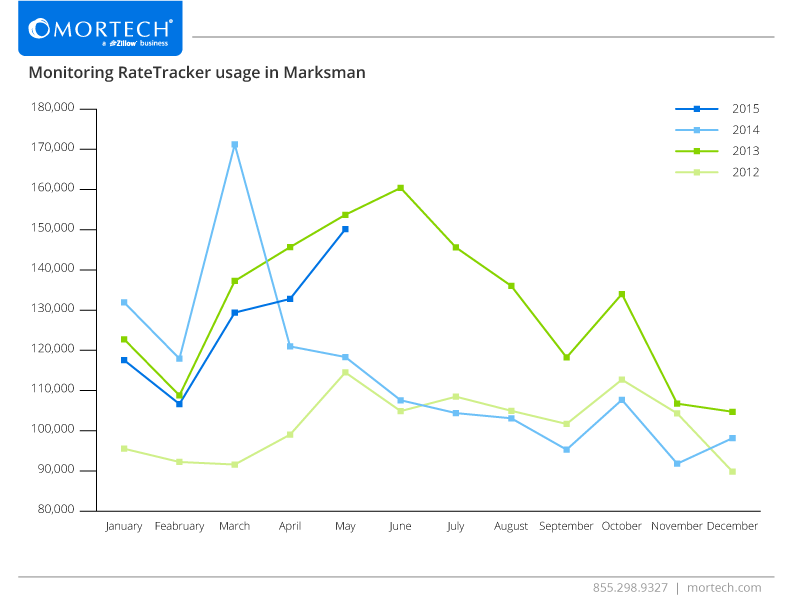 According to data compiled internally within our mortgage pricing engine, Marksman, we took a look at the amount of rate trackers used each month over the last three and a half years in an attempt to pinpoint when and how they can best be used. Starting back in 2012 and working our way up to May of this year, we examined the total amount of rate trackers used each month, and made side-by-side comparisons with the corresponding months of each year, putting all of it together in one, simple graph. Other than a spike in March of 2014, the utilization of rate trackers has followed a pretty consistent curve over the last three and a half years, with usage hitting its peak in May and June, and slowly tapering downwards until it hits a second spike in usage in October. This means that if 2015 is set to follow the curve that has not only occurred over the last few years, but one that it’s already mimicking, then we’re in the thick of rate tracker season. However, it’s important that June isn’t the only month viewed as important here, as May also plays a significant role in loan and rate tracker activity right now. Why? Because loans that use a rate tracker take an average of 15 days to close, meaning that many loans that originated in May are beginning to close in on that average lock date period. That means that the clock is ticking on locking in those loans with your borrowers, as well as getting a jumpstart on June to fully utilize rate trackers with your loans. But why are rate trackers such a big deal anyway? What makes them so important? Well, approximately 2/3 of borrowers who had a rate tracker sent with their loan ended up closing on said loan, meaning that it greatly increases the chances the borrower will close on the initial loan. This is a huge tool for loan originators to utilize, and one that could be the difference in closing loans in the coming months. To learn more about how to utilize Marksman’s tools like our rate trackers to better serve your business and nurture your leads, you can schedule a session with a member of our training team. Or, if you’re looking for more information on Marksman, you can schedule a free, consultative demo today.